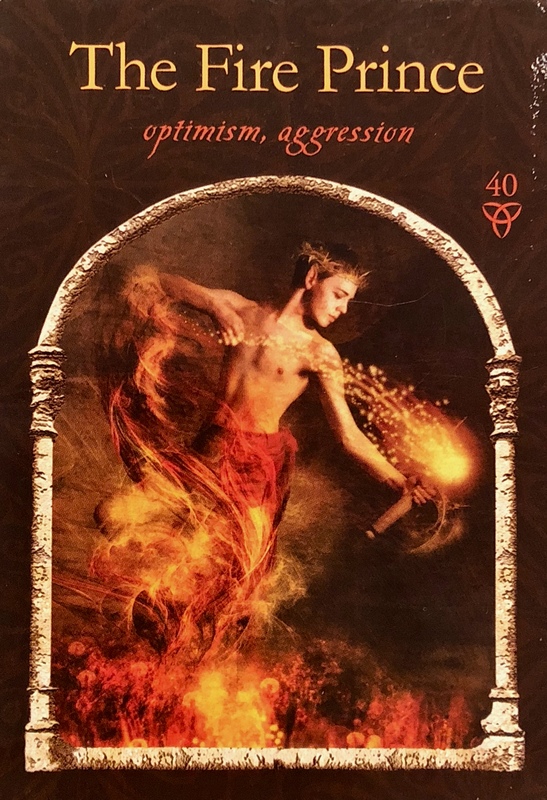 As Ally: “When The Fire Prince arrives as your Ally, he lets you know that he represents the invisible forces behind all manner of manifestation, and he brings you the gift of optimism. You will be rightly inspired to move forward and take confident and assertive action to reach your goal. Envisioning the path of the highest good with an optimistic outlook, The Fire Prince also brings you the gift of a miracle. Things come together as if by magic to create the reality you see. As Challenger: “There are a couple of message delivered by The Fire Prince, so take heed as one or both could pertain to you now. Be mindful of starting a fire you can’t put out. Aggressive action results in loss; slow down and do not be so eager to reach your goal. Stay clear of someone else’s unbridled ambition and aggression as well. If you think you could get burned, you most certainly will – unless you remove yourself from the action. This is a reminder to bring balance to your passion and intention. Know that you have everything you need in order to manifest your dreams. Do not get hung up on the possibility of someone ‘stealing’ what is rightfully yours. This changes the energy around what you are creating. Light your fire from within and do not worry about what anyone else is doing. No one can take something from you that is truly yours. If they are able to take it from you, it is because the Universe has sent them to do so, in order to save you from going after the wrong opportunity. Use your wiles instead of aggression to get what you want. Pull back if necessary. Have absolute faith that what is yours will come to you. Know that the energy you put out is what will come back to you. Focus on the fire of passion and avoid power struggles.